This trip gives you a great opportunity to see all highlights of Mongolia. We takes you deep into the Mongolian outback with the experience of living like a nomad and experiencing the culture first hand of how the local people live on the vastness of Mongolia's huge landscape. 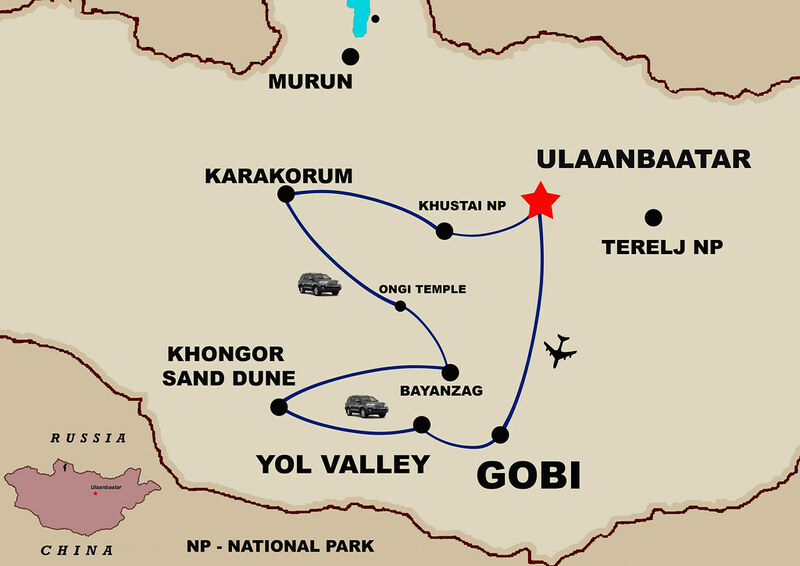 We traverse this amazing land using SUV's and camping beside lakes, riding horses, seeing Shaman rituals first hand, seeing how the Mongolians survive here like their forefathers have done for centuries plus lots more. This is an adventurous experience like no other and it's very easy to see why Mongolia is one of the fastest growing destinations for exploration tourism. Arrive at Ulaanbaatar. Meet your Guide at the airport and transfer to the hotel. We will star city tour the first stop is Sukhbaatar Square, the central square named after the revolutionary hero of 1921 Damdiny Sukhbaatar who declared independence from China. We visit Gandan Monastery the largest and most famous functioning monastery in Mongolia; here we may experience monks in worship and see the impressive Golden Buddha Statue of Migjid Janraisig. Time permitting Natural History Museum which is famous for its authentic dinosaur skeletons and visit Zaisan memorial hill to view of whole city from there. Welcome dinner at restaurant and stay overnight in hotel. (B, L, D).